Crewe and Nantwich fracture patients are to benefit from fewer hospital visits and shorter waiting times with a new “virtual” fracture clinic. The scheme, the first in Cheshire, has launched at Leighton Hospital in a bid to improve care while cutting the number of times patients have to visit the hospital for an appointment. An ‘Autumn Concert’ fundraiser in Wistaston Memorial Hall proved a hit with the audience. The concert featured the Crewe Concert Band along with impressive solo performances from Chris White (ukulele) and David Clews (harmonica). Festive families are gearing up for the annual Nantwich Santa Dash event to raise money for Hope House Children’s Hospice. The race takes place in through Nantwich town centre on Sunday December 10, sponsored by Tarporley-based recycling firm RUKGroup.com. Crewe and Nantwich rail users could be hit by further transport problems as Virgin Trains West Coast staff announce strike action in December and January. The action comes after RMT Union members voted by 9 to 1 in favour of striking in a dispute over pay. More than 60 members and guests gathered in Nantwich Museum to celebrate 50 years of Nantwich Civic Society. The organisation has been serving the community and town to ensure conservation, good design and practical volunteering thrives. The 62nd Cancer Research UK ‘Xmas Fair’ at Wistaston Memorial Hall has helped raise more than £3,700. The event was organised by the Crewe & Nantwich Cancer Research UK Group. More than 100 firearms, including 26 in the Crewe LPU, were handed in to Cheshire Police as part of a two-week surrender. Residents across the county took part in the national initiative, which gave them a chance to safely dispose of firearms or ammunition, whether held lawfully or unlawfully, without the risk of prosecution. A second half brace from Steve Tames saw Nantwich Town bow out of the Integro League Cup after a 3-2 defeat at home to Witton Albion. 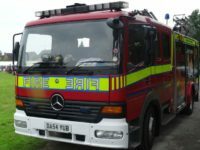 Fire crews battled a house blaze at Doddington near Nantwich for almost six hours. The incident happened at a property on London Road, Doddington, and began at about 11pm last night (November 28). A former soldier and Nantwich dad has been commended with a national bravery award after tackling armed robbers in London. Richard Whitehouse, 46, received the Sheriff’s Award for Bravery Certificate of Commendation at a prestigious awards ceremony in London. More Christmas events are coming your way as Nantwich families see in the festive month of December. Santa returns to Nantwich Civic Hall with another fun-filled Christmas Show this Saturday December 2. A sign from the signal box which used to control a railway junction has been returned to Nantwich – almost 50 years after it was last seen. The Nantwich-Market Drayton Junction sign is now being displayed at Nantwich Museum on Pillory Street. Nantwich Singers will be presenting an hour’s concert of Christmas Carols on December 9 in St Mary’s Church. The chamber group of 16 voices will perform under the theme “A Spotless rose” – taken from an ancient German hymn “Es ist ein ros entsprungen”, translated as “Lo, how a rose e’er blooming”.